The unveiling of the details on The Living by Isaac Marion is this moment's most surprising news, as far as I am concerned! After losing his publisher Atria Books, a long hiatus, and so many months toiling looking for a new home for his final Warm Bodies novel, I almost thought we will never be able to read it. But luckily after deciding to publish the book independently, the author's much awaited book will finally be ready for the taking this year... in just about a month! The physical book will be a signed hardcover edition and will only be available on the author's website. Other electronic editions are available from online book sellers as well. 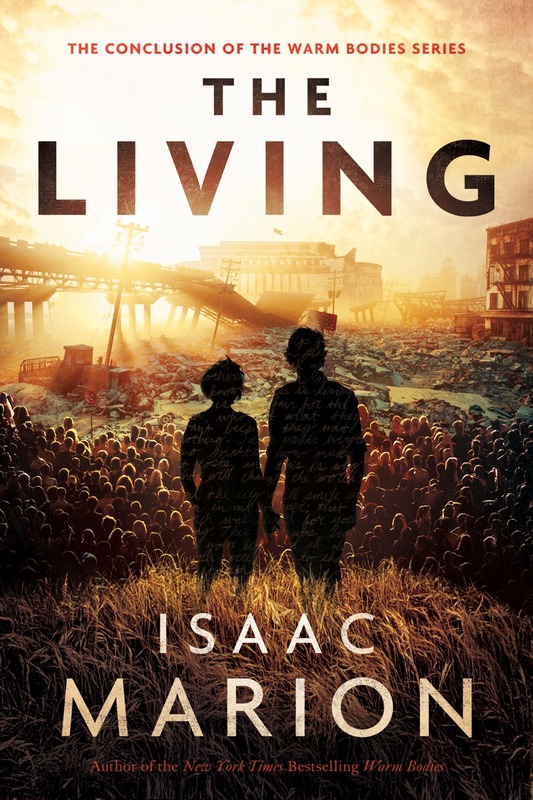 Check out the cover of The Living by Isaac Marion. The New York Times bestselling Warm Bodies Series has captivated readers in twenty-five languages, inspiring a major film and transcending the zombie genre to become something "poetic" (Library Journal) "highly original" (Seattle Times) and "ultimately moving" (Time Out London). Now the story of a dead man's search for life reaches its conclusion on a scale both epic and intimate. Before he was a flesh-eating corpse, R was something worse. He remembers it all now, a life of greed and apathy more destructive than any virus, and he sees only one path to redemption: he must fight the forces he helped create. But what can R, Julie, and their tiny gang of fugitives do against the creeping might of the Axiom Group, the bizarre undead corporation that's devouring what's left of America? It's time for a road trip. No more flyover country. This time they'll face the madness on the ground, racing their RV across the wastelands as tensions rise and bonds unravel—because R isn't the only one hiding painful secrets. Everyone is on their own desperate search: for a kidnapped daughter, a suicidal mother, and an abused little boy with a gift that could save humanity... if humanity can convince him it's worth saving. The Living by Isaac Marion will be released on November 13, 2018. You can get a copy of the book through the author's website.